Jalapeño Pecan Brittle, Pecan Brittle: Oliver Pecan Co.
Don't laugh its not a misprint. This is our best selling brittle. Our brittle is made in small batches in our copper kettles, poured on marble tables and hand pulled. Then we add the some heat with jalapenos. The brittle still has that sweet crunch, but then it's followed by some heat. This is best brittle I have ever had in my life. Order now...when the word gets out this will be hard to get! Great flavor!! 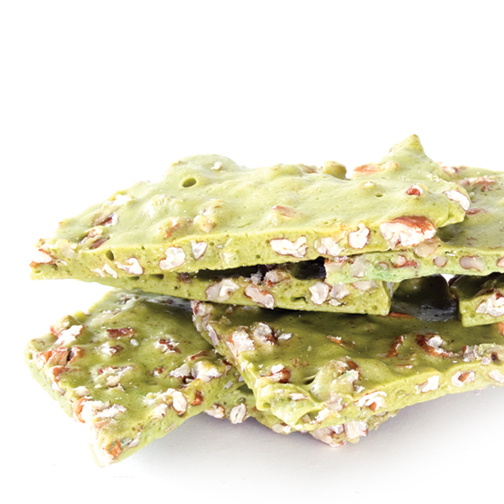 Jalapeno Pecan Brittle is delicious! The jalapeno pecan brittle is amazing. I can't get enough! It isn't hot or spicy . . there's just a hint of bite at the end. Love this stuff!